I haven’t been much inspired this year to create any Halloween looks on here but then I got a spark today and just had to do something. 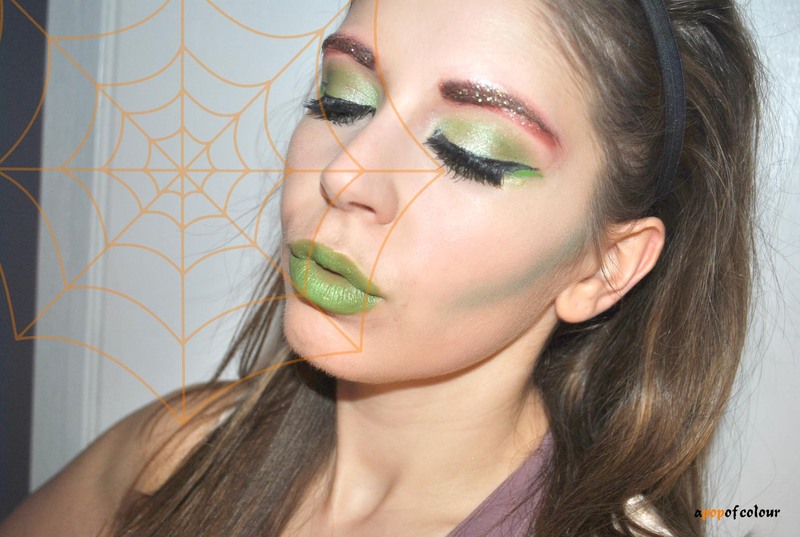 I did a fairy look last year but that one was much different from this – more glam, whereas this is more forest nymph. The best part is that you can swap out the green lipstick for red, glue some leaves above your eyes and this can easily translate into Poison Ivy. Anyways, enjoy the look and let me know if you recreate it! 1. Starting with the eyebrows, grab a red cream eyeshadow and paint this over your eyebrows. I used Covergirl’s Flamed Out Shadow Pencil in Red-Hot Red (if you have the Make Up For Ever Flash Color Case – which I use in this tutorial – you can use the red from that). If you want to be really gung-ho, use spirit gum to cover the brows them draw them back on with the red. From there (and before the cream product has set), grab some loose glitter and coat this on your eyebrows over the red. I used Make Up For Ever Holodiam Powder in #302 and #303. These were limited edition for the holiday season last year but you can use any glitter, this was just the stuff I have in my collection. 2. Using a green cream product, apply this on your eyelids acting as a base. I used the green colour from the Make Up For Ever Flash Color Case. 3. With a light green eyeshadow, apply this to the inner corner towards to the centre of your lids. The green eyeshadows I use in this tutorial are from the Sephora Color Anthology palette which is limited edition for this holiday season (review coming soon!). 4. 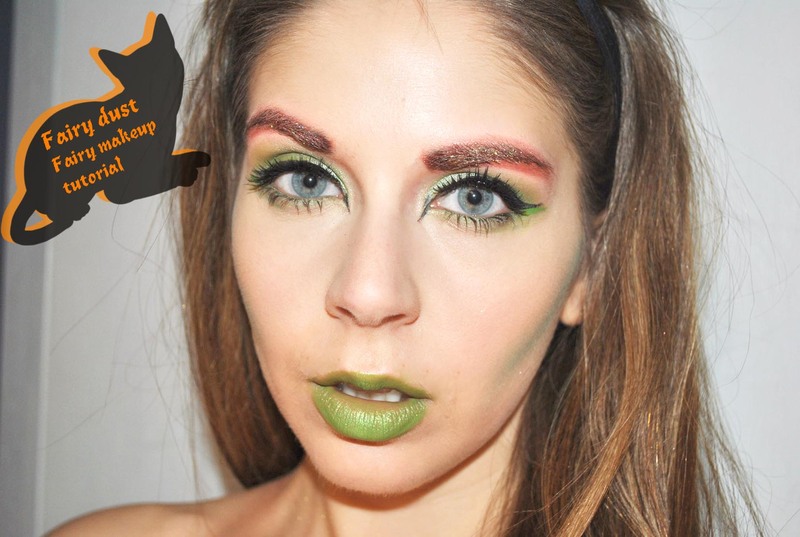 Using a blending brush, grab a matte lime-green eyeshadow and sweep this into the crease area. 5. With a darker green eyeshadow and your blending brush, work this into the crease, darkening up the eye area. 6. With a black liquid eyeliner, apply this to your upper lash line, winging it out longer than you normally would. I also took this longer in the inner corners of my eyes to make them appear more whimsical. 7. Using the darker green shadow that you used in the crease (not the matte one), apply this along your lower lash line. 8. Apply a couple coats of mascara and some false lashes (a must!). 9. Apply your foundation and concealer. The concealer should be at least two shades lighter than your skin tone and really layer this under your eyes to brighten up the area. To set everything, use a translucent powder. I used IT Cosmetics It-02 Ultra Repair Liquid Oxygen Foundation in Light, Make Up For Ever’s Five-Color Camouflage Concealer palette, and Make Up For Ever Microfinish Powder. 10. Going back with that cream green, draw a line right underneath the black wing. Here is where you can get really creative with this look. I chose to keep it simple but you can definitely show off your art skills with different colours and designs if you wish. 11. Using the green eyeshadow again, sweep a crease brush in it and then apply this to the hollows of your cheeks to contour. 12. To finish up the look, use either a green lipstick or the cream green colour and apply this to your lips. To add a little shine, apply the glitter over top. Happy Halloween! I hope to have one more makeup look up before next Thursday, but we’ll see if I feel inspired ;). Also, I am one of many beauty blogs participating in the Made In Blog Awards. Click here (or click on the button in the sidebar) to vote. You don’t have to register (it literally takes a second) and can vote once per device. Thanks in advance!! Oh wooow! The green lips really pulled the whole look together! This is a bit daring for me but you managed to make it look (scary) glamorous!